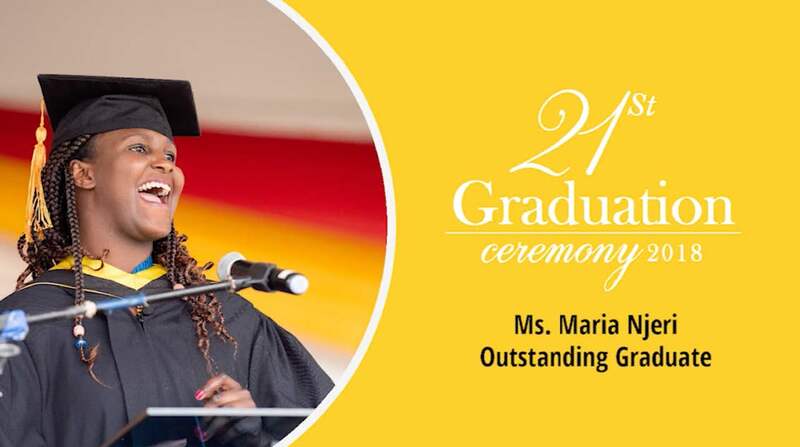 In October, Maria Njeri stood before a crowd of over 3,000 people, beaming with joy and gratitude as she spoke on behalf of her graduating class at Africa Nazarene University. At age 25, she had come a long way from the days of people calling her a “cabbage” who would never learn to speak or walk. Njeri was diagnosed at birth with cerebral palsy. A lack of oxygen during birth damaged her cerebrum, the part of the brain that controls joints, muscles and the nervous system. “It is a shame for the family and the child to live because of the negative attitudes based on culture beliefs and traditions,” Njeri said. She looks back with compassion for her parents. “When my family got the news that, ‘You have a beautiful baby girl, but she unfortunately developed cerebral palsy,’ it breaks my heart thinking, they must have been disappointed and (in) anguish,” Njeri said. But she considers herself “one of the blessed ones.” Her parents loved and accepted her, doing everything they could to give their daughter her best life possible. Her mother quit her job to stay home and care for Njeri, while her father worked hard as an electrical engineer to afford medical treatments. Starting at 6 months old, Njeri took part in all kinds of therapy, from physical therapy to occupational therapy to speech therapy. Njeri grew up on a family farm — alongside grandparents, uncles, aunties and cousins — in Kikuyu, Kiambu, a town outside Nairobi. She continues to live in Kikuyu today. Njeri’s fondest memory, she said, was when her dad would pick her from school and take her walking around town, hand in hand, and then back to his office at the family’s carbon brush company. In most cases, Njeri was the first and only child with cerebral palsy at her school. But it wasn’t until primary school that she started to realize she was different. Her speech and movements were more labored than the other kids’. This realization turned into a rollercoaster of denial, she said. That simple question — “Why not you?” — started to transform Njeri’s way of thinking. “It answers the questions in my life, that there must be a God-given purpose and a special assignment for me,” she said. Njeri went on to complete secondary school and started applying at universities in Kenya. This was no valid reason, Njeri said. She pushed through the shame of each rejection and kept trying. In 2013, she was accepted to Africa Nazarene University in Nairobi, Kenya. Opening those doors was not a simple task. Even at the collegiate level, Njeri had to overcome the stigma around her differences. Njeri reflects back on these difficult encounters with compassion. Njeri said her biggest joy was becoming lead usher in the chapel at the town campus, a satellite campus in Nairobi’s city center. “As an usher, my role was to bring joy and warmth to people coming into chapel, which made all the difference,” she said. After considering studying law or journalism, Njeri decided to major in community development at ANU. “Looking back I was in search of a voice to speak up and change things,” she said. Njeri was among almost 900 ANU graduates on Oct. 26, 2018. As commencement neared, a leader at the university took special note of her journey. Being asked to present was an honor, Njeri said. However, in the days leading up to the ceremony, she got sick and lost her voice. In attendance was the president of Kenya’s Supreme Court, Chief Justice David Maraga, along with leaders of the local area and dignitaries from all over Africa, Adundo-Yogo said. Njeri said she searched deep in her heart to find the right words for her classmates. She stood before the crowd with joy and grace, deliberately pronouncing each word, pausing often for applause during her five-minute address. The future, she said, needs believers. “Believe in yourself. Believe in the goodness of humanity. Believe in sustainable change. Believe in no corruption in Kenya. The audience erupted in applause as thousands of people rose to their feet. Njeri’s smile continued to beam as she made her way back to her seat. With her bachelor’s degree in hand, Njeri has her eye toward earning a master’s and a doctorate degree. Her aim is to develop a greater level of social inclusion in Kenya for people with disabilities. She is also passionate about advocating for the rights of children. Njeri started an organization called the Njeri Maria Foundation, which advocates for and supports people of different abilities. She has also gained media attention in Kenya and has been invited to lead trainings and sit on panels. “Back in Kenya, she is the face of CP,” Apondo-Yogo said. Njeri is optimistic about her future, and the future of her work in Kenya.